Havens nurture your mind, body, and spirit. They refresh and bring comfort like little else. Isn’t it time to start transforming your home to a haven? Ever since I was a little girl, I’ve noticed there is a big difference between a house and a home. And there’s even a bigger difference between a home and a haven. In my mind, houses simply are dwelling places. You can live in them, but they’re not welcoming. Think of a hotel room – or even a hospital room or dorm room. They’re a place to spend the night, but you don’t really want to settle in. When I think of places like this, I imagine bachelor pads. There’s a bed, a bathroom, and couch and a chair, but there’s no way you truly feel comfortable there. In fact, while you’re there, you may always wonder when you can go out, just to get out of that space. A home, by definition, is a place where you live. Homes seem cozier than houses, because there’s a lot of life in them. They may even be decorated beautifully or comfortably. And plenty of people live in homes. But as much as you may relate to “home sweet home,” I think there’s another category … havens. You know a haven as soon as you walk in the door. You feel welcomed. You’d like to stay there for a long time. You might appreciate the décor, but it’s not that’s not the most important aspect. Peace is what stands out. Love and attention are key. I’ve been to plenty of homes before. It’s havens that I love to visit, though. Havens are the places where I wonder if I’ll overstay my welcome simply because I never want to leave. I love the deep conversations. The décor piques my interest. The food or drink, whether simple or elaborate, store-bought or homemade, is thoughtfully served. When you leave a haven, you feel refreshed. You feel noticed and nurtured. It doesn’t take that much effort to transform a house to a home – add some throw pillows, put some art on the walls. But transforming a home to a haven? That takes some thought. It takes some time and a whole lot of intention. It also takes overcoming common obstacles like clutter and overwhelm. The great news, though, is it’s not impossible. From my own experience, I know while haven creation absolutely is possible, it doesn’t naturally happen. I’ve been interested in creating cozy havens since I was a teenager. And throughout my life, I’ve had a lot of practice … after I graduated high school, I lived in 12 different places in 18 years. Each time I moved, I took on the unique challenges in each new home. Some were teensy tiny spaces – one of my homes was nicknamed my “Munchkin Apartment” because the ceilings only were 6 feet tall! Many had outdated, mismatched appliances. Others were rentals and lacked wall color and any character at all. But no matter how challenging it might have been, I transformed all but one of the spaces into true havens. That one and only non-haven was a rental my family stayed in for a year during the middle of a spiritual and relational crisis. At the time, I felt like I could barely survive with my husband and two babies in that tiny space. Because it felt like punishment, I put absolutely no effort into haven creation. 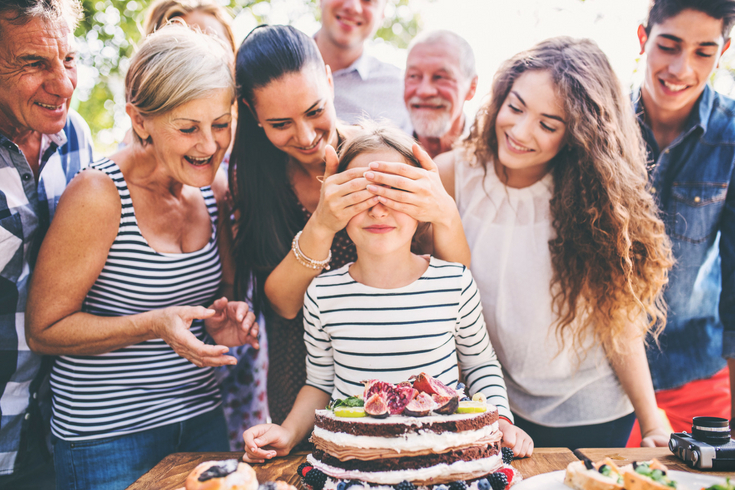 After NOT experiencing the blessing of living in a haven at that time, I fully understand how essential the spiritual, relational, and physical aspects are. I fully know how bleak daily life can be without a haven – and how much comfort and peace a haven can add. 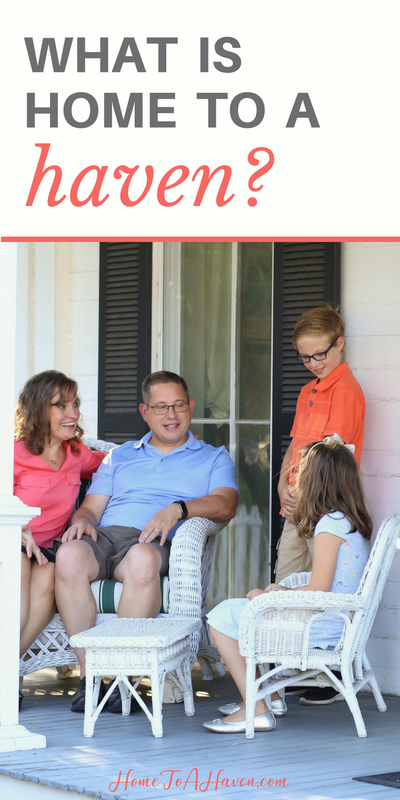 For the past three years, I’ve been writing about homemaking at No Place Like Home. And during that time, I’ve realized the importance of havens – and how very much my readers long to create them. When No Place Like Home naturally evolved into a haven creation blog, I wanted to make sure havens became the focus. And that’s why I’ve started Home To A Haven. Far too often, homemakers focus on the physical. They’ll zero in on a comfortable home and fret if their rooms don’t look like they belong on HGTV. But a physically appealing haven is only one piece to the puzzle. The most gorgeous homes won’t be havens if they’re filled with fighting and strife. And even if relationships are pleasant and a home looks good, there will be no true peace if a spiritual haven isn’t established. and the actual physical aspects of your living space. Need some haven creation help? 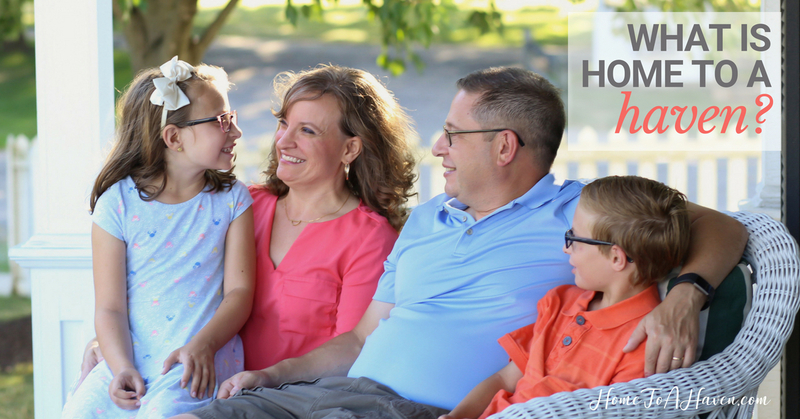 Home to a Haven is here to help with your own haven creation process, so you can move beyond living in just a home … and enjoy a haven that will nurture you and anyone who enters your door. 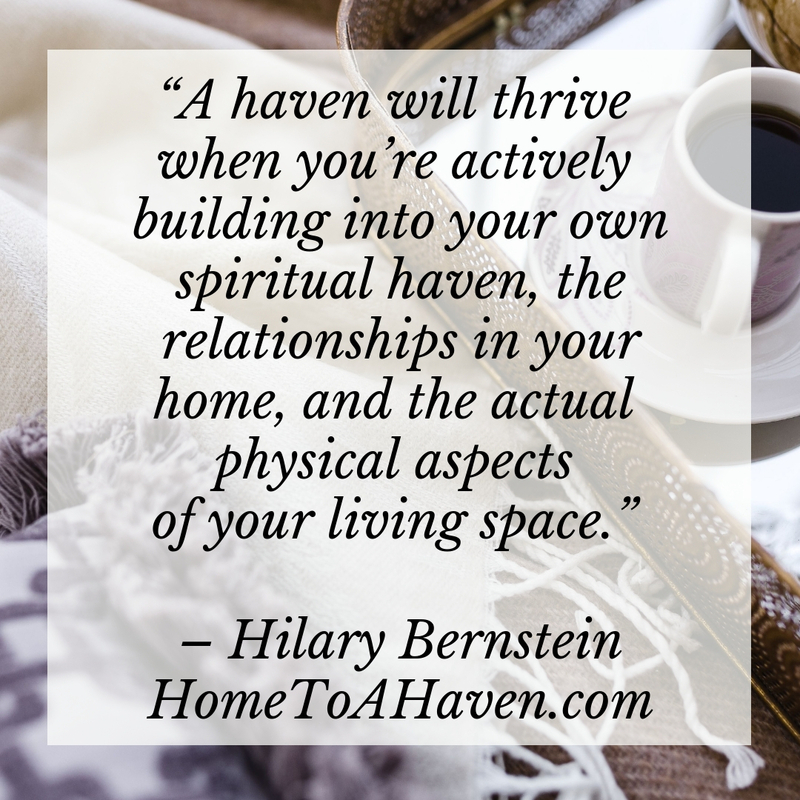 If you already know what your haven is lacking, you can find help for your spiritual haven here, your relational haven here, and your physical haven here. If you have no idea what you should work on first, take this quiz to find out what kind of haven you’re already amazing at creating. And you’ll find out what could use a little work. For long-term help with your haven, sign up as a Home to a Haven e-mail subscriber. I’ll send you a quick-start guide, Begin Transforming Your Home Into a Haven in Less than 30 Minutes. 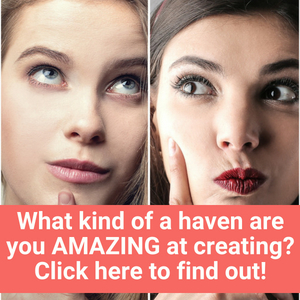 I’ll also e-mail haven creation tips directly to your inbox each week. 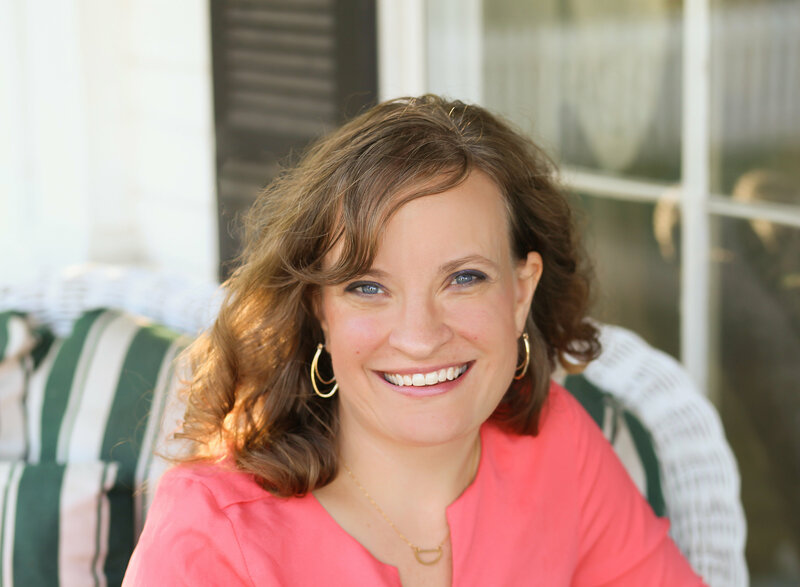 Click here to enter to win a FREE private 30-minute haven creation coaching call with Hilary! Together, we can make sure you feel like you’re coming home to a haven. I can hardly wait to start the process with you! 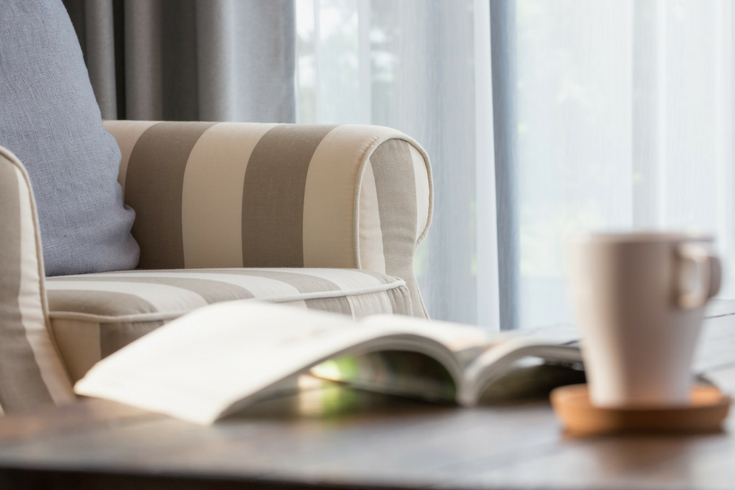 Have you already started turning your home into a haven? When you visit someone, is the difference between a house, home and a haven fairly obvious to you? All images courtesy of Katie Baker and Adobe Stock. I think the name change is great! I know exactly what you mean about walking into some homes and knowing it is a haven. Your example about the three legged stool makes so much sense. Each part is needed! Ready to start investing in the relationships in your life? Let's get started! Do you long to thrive in a spiritual haven? Get started!